Looking for an alternative approach to reactionary stress management techniques? Seldom does a day go by when the word 'stress' is not mentioned at least once, either by yourself or by someone you know. There are various techniques that can be used to help relieve stress, however, most if not all of these techniques can be described as reactionary in nature. In other words, they are activities that one does in response to stressful stimuli. "Positive Self-Talk" focuses on stress as an internal pressure - what you do to yourself to cause or create that stress/pressure - then provides insight on what you can do proactively to aid yourself in managing or relieving that feeling to a significant degree. "Positive Self-Talk" also provides practical examples of stressful stimuli that can occur on a daily basis, and presents ideas and applications that are relevant to the workplace, social interactions, relationships, volunteer work, and many other settings. or a glass-half-full type of person?" 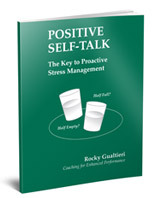 "Positive Self-Talk" is available for $19.99 (CDN) per copy plus shipping and handling. To order your copy of this book using your PayPal account (confirmed addresses only), click here or on the Buy Now button located on this page. You will be notified by e-mail when your payment has been received and your order has been shipped. Please allow a minimum of 4 weeks for delivery. For single orders of 20 books or more, your company logo can be printed on the cover of each copy at no additional cost. Contact us at 1-905-439-0485 for more details.